No matter how my journey starts or what my intentions are, somehow I always end up in Yangshuo. I was first exposed to the town in 2009 at the tender age of eighteen, and back then it seemed like heaven on earth. Surrounded by those lush green mountains, those alien shapes that rose up around the Li River and suggested that perhaps, just perhaps, something otherworldly was going on in this place, one couldn’t help but feel a sense of wonder. I was in a daze, full of the liveliness of the crowds as they jostled for the chance to haggle for yak bone carvings, revel in the costumes of the Miao people, or tentatively make the jump from solid land to bamboo raft. Having only ever been to two other Chinese cities in my life, I suddenly felt as though I truly wasn’t in Kansas anymore. 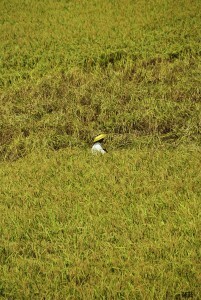 One morning, in my naivety, I was even convinced that I could hear a panda outside my window. I rushed to the balcony, camera in hand, only to find that it was just a squealing pig. In my eighteen-year-old mind, China was just a place crammed full of stereotypes. Surely pandas should be everywhere? And weren’t there supposed to be kung-fu schools on every street corner? Where was Jackie Chan when you needed him? It was Yangshuo that defied my expectations and finally taught me that China is just like everywhere else; its people think, feel, live, love, and try to get by just like the rest of us. There were no Shaolin monks dancing through the streets, no scholars stroking their beards and quoting Confucius, no beautiful concubines giggling coyly behind their silk fans. 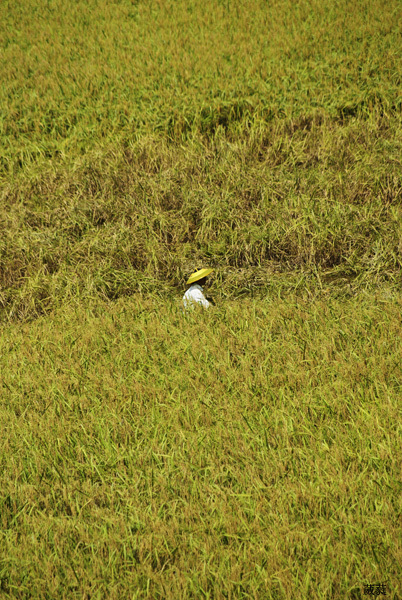 There were just people selling their harvest, fishing for their dinner, or bent double, up to their knees in mud, planting their rice. After three months of living and working near Yangshuo, after so many weekends spent relaxing under the shade of Big Banyan, cycling to Moon Hill, or playing pool in Buffalo Bar, I was loathed to leave. I boarded my flight to Chengdu, wondering whether I’d ever return. But, by 2013, I was finally ready to go back. Armed with my savings, with three trusty years of Chinese language learning under my belt, a contract with a Chinese company and the ugliest yellow Chinese to English dictionary, I made my way back to Yangshuo. It was bigger, it was better, yet somehow it had remained almost completely unchanged. There were now two McDonalds and the Buffalo Bar had tragically shut up shop, but it was still the place I remembered. My heart warmed as I walked the full stretch of West Street, feeling those smooth flagstones beneath my feet and wondering whether any time had truly passed. 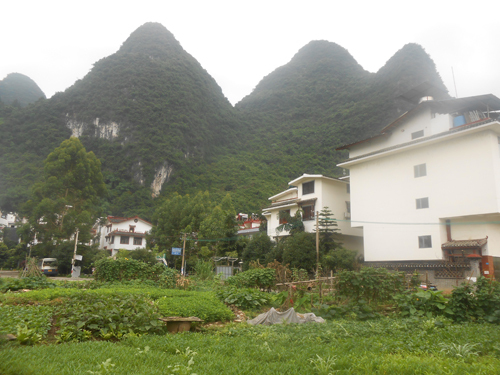 In the years that followed, Yangshuo would become my base of operations, like a home from home. This was the place where, during a monsoon, I once hid under the eaves of the Yangshuo Park gate with my friends and drank hard liquor from a plastic bag. This was where, in a bar along West Street, I had an in-depth conversation with an elderly Chinese gentleman who only ever wore silk pyjamas, who introduced me to his beloved pet, a tiny river snake, and who the next day serenaded me in the park with his erhu. I remember shooting fireworks from the roof of a local hostel, watching a rap battle between two Chinese men who clearly still wore braces, running through the streets at night with wild abandon brandishing a barbecued fish on a stick, and watching as weeping mourners in funeral procession carried the dead through those flagstone streets. 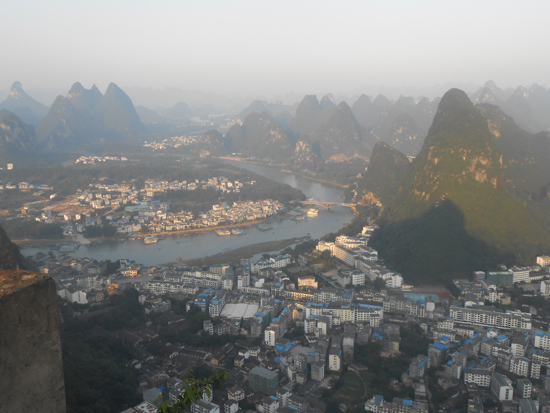 For me, and for so many others, Yangshuo was a place of comfort and adventure. No matter where I live in this great country, I’ll always have a safe haven nestled within the mountains. 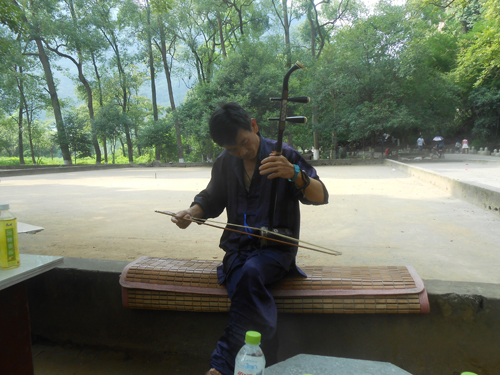 Erhu: A traditional Chinese stringed instrument. It is a bowed instrument with only two strings but it can produce a wide variety of sounds. It is sometimes referred to as the “Chinese violin” or “Chinese two-stringed fiddle”. I was only 16 years old when I made my first trip to China. I was nervous, but alive with the anticipation of seeing a place that had been so alien to me for so many years. We were on a school trip, a 10 day tour that started in Beijing and ended in Xi’an. The first few days were a blur of fresh sounds, tempting smells, the cry of peddlers, and the magnificence of ancient buildings that were unlike anything I’d ever seen. I have vivid memories of being introduced to a man’s prize fighting cricket in one of Beijing’s many Hutongs and of running up the steps of the Great Wall, full of vigour and wonder. By the time we boarded the overnight train to Xi’an, I thought the dream was over. In my naïve opinion, nowhere could be as gloriously enchanting as Beijing. So, as the train approached the station, I already had my reservations about the city of Xi’an. Stepping out of the train, I noticed immediately that the atmosphere of the city was vastly different. The pace of life was still as fast, though perhaps not as frantic as Beijing, but the city seemed to have a more rustic feel. People moved deliberately, rather than recklessly, and the population appeared to be older than that of Beijing’s. 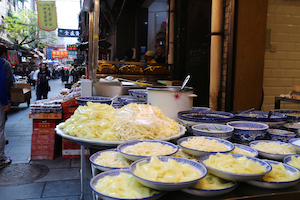 Bizarrely enough, perhaps my most memorable meal of the trip happened in Xi’an. I’d tried the sumptuously crispy Peking duck, I’d sampled a platter of plump Beijing dumplings, yet it was the plate of biángbiáng noodles I had in Xi’an, in a restaurant barely the size of my living room, that I remember most vividly. The restaurant itself was above a bustling local market and the sound of bartering was almost deafening. The rooms had an unnerving smell to them and what little tableware we had was clearly still dirty. When the food finally arrived, the thick strips of noodles looked like belts slumped on the plate, soaked in a brownish sauce that smelled acidic and unappetizing. Yet rather than feeling deterred, I remember feeling somehow at ease. 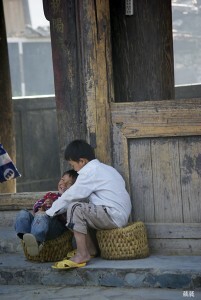 A wave of happiness washed over me as I realised that, lovely though Beijing was, this was the real China. This was the place I had longed to visit for so long, and I finally felt at home. I tucked into the noodles with hungry fervour and found them to be so delicious that words failed me. I just sat there, a thick white ribbon of noodle hanging from my mouth, in sheer ecstasy. The following day, we were to visit the mausoleum of Qin Shi Huang, a man I had never heard of nor had any particular interest in, and I was still certain there would be nothing there for me. After all, no structure could inspire me with as much awe as the Marble Boat in the Summer Palace. In fact, to this day I still dream of Empress Dowager Cixi, stood still in time, languid on her immovable boat. 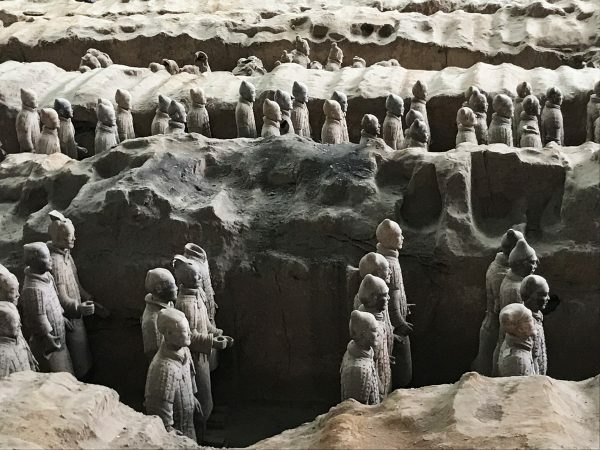 From a young age, I had been vaguely aware of the existence of the Terracotta Army, but had no real idea who they were or what they looked like. To me they were the stuff of legend, as mythical as the soldiers hidden inside the Trojan Horse. So, as I set foot in the first pit of the mausoleum complex, I had no idea what to expect. The air was still and, from where I was standing, the pit was hidden from view. Slowly I crept towards the ledge and, as I looked down, I felt as though the wind had been knocked out of me. I remember recoiling, both in horror and awe, at what I had seen. There, just a few feet below me, were perfectly formed lines of officers, foot soldiers, archers and horses, all holding position, all ready to attack. They went back as far as my eye could see, all of them staring out at me with unique faces, each one representing a life that had long since perished. Individually they looked calm, but together they created an atmosphere of tension, somehow intimidating in spite of their lifelessness. For one horrible moment, I had thought they were alive. For the rest of the day, I was almost completely silent. I wandered through the other three pits, through the museum and the gift shop, in a catatonic state, unable to process what I had experienced. I knew that I had to grasp this opportunity, to try and capture these feelings in some meaningful way. In the gift shop, I found a tiny set of terracotta warriors that had been forged in the same way as the originals. They were a common souvenir, consisting of one officer, one foot soldier, one archer and a horse, but I had to have them. In a strange way, I had to know that what I had seen was real, I had to have proof. To this day, there are no words to describe precisely the impact those soldiers had on me. Yet as I look over at those four little figures still silently guarding my windowsill, I am overwhelmed with the desire to try. More than 1300 years ago, a poet wrote this poem to describe the landscape around Yumen. I am not a good translator, meanwhile, you know that the poem is always very difficult to show its feeling in a different language. From the poem, we get the information that the land outside Yumen Gate was already barren and infertile. The Yellow River was flowing far away. The only town stood besides the barren mountains. Plants should not be blamed not living there, since the spring wind couldn’t get through the Yumen Gate. It seems that the Yumen Gate is the line between life and desert. Back to the 21 century, the situation seems worse and worse. Not only the area outside the Yumen Gate is difficult for all creatures. In fact the Yumen Gate is standing in the desert. 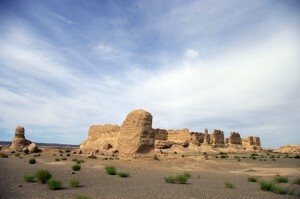 We drove 90 km by motorcycle from Dunhuang to get there. In my opinion, motorcycle is the best vehicle in this area. The road has not been ready for little cars. Bike cyclists may suffer a lot from the heavy sunshine and it is a really bumpy rode. But there is also a bad news for motorcycler – no gasolinestation on this road and the oil tank may be too small to manage a 180 km journey. Thousands of beautiful or sad stories about this area are attractive for people to come here. When we think about Yumen, we are likely to get a picture that a General is standing on the gate, looking at the area outside, or a picture of millions soldier fighting in the blood, shouting into the sky. 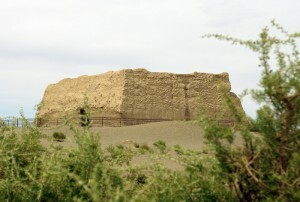 This was an important fort for Han people who living inside the Yumen Gate. Once the nomadic group outside won the war and occupied their land, they didn’t know what would happen to them. On the other hand, the group outside the gate did want the good land to grow their population and to enjoy a better life conditions. You know that every war has a reason related to the land, never changes. Any way, nomatter what happened thousands years ago, the place has become a real desert gradually. I just saw a lonely yellow mound stands here. History cannot keep silence. 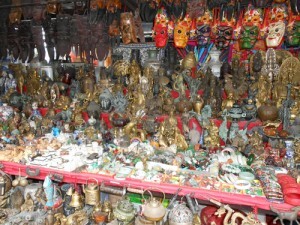 Besides the Yumen Gate, there is the other Han relic called Hecang Town. It was a busy town 2000 years ago. Caravans passed there one by one. They had high street, hotels, restaurants and many shops. But now there are just several yellow walls. Weeds are everywhere, winds blow with sands. Whose hometown is in the dream? I told my friend, I might go to Guizhou to run a small café in a lovely Dong village. They treated it as a ‘day dream’. Who will be your consumers? Are there enough tourits? Well, their points may be correct. I don’t think Dong people will enjoy coffee. Any way, if I have enough money to run my café, it will not be for earning money. It is just a way of enjoying life, in a peace. It is not just who dream to live there. It is also a dream for natives, since most of them have left there to find jobs outside far away. Beautiful places always hide in mountains. 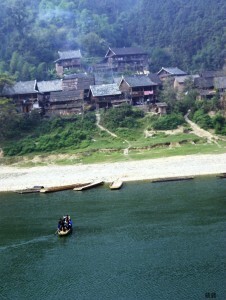 Guizhou is described as ‘no more than three days for sunshine, no more than three miles for flat’. Mountains and hills occupy 92.5% of fields in this province. Not enough filed is for farming. Traffic system is not good enough to connect every village, especially the minority ethnic groups. All these features constrict the development of local economics. But people need to improve their life conditions. They want their next generation to have better life. So they go out to earn money. Every Dong village is beautiful and peaceful; some are too quite to let me believe that no people are living there. It is a little bit scary. You might think you are really in a dream. Young people are not easy to see. The most common picture of there is that some children are playing around some old ladies. 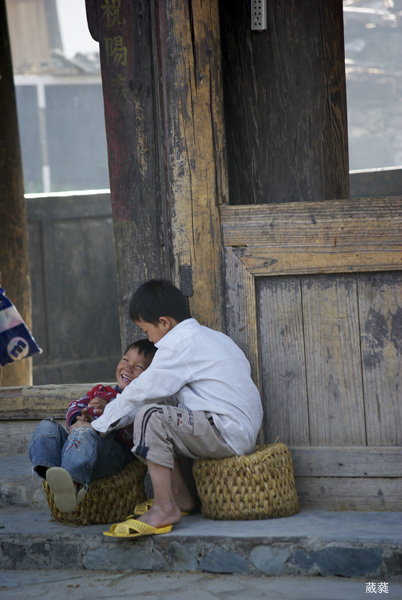 For some popular villages for tour, there are some young girls and boys offering performance to tourists when off their class, such as Sanbao and Zhaoxing. 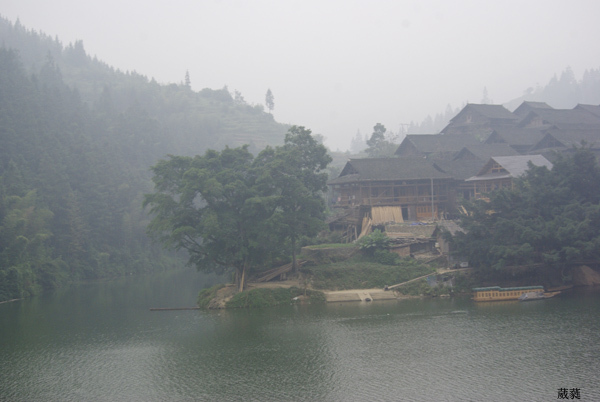 Sanbao is near the town so it is easy to be reached; well Zhaoxing is famous because it is the biggest Dong village. 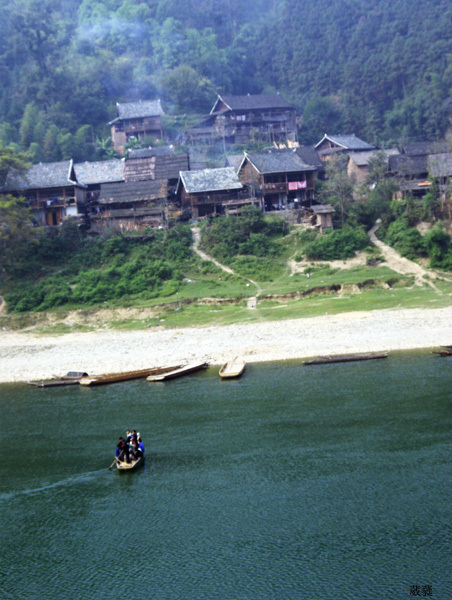 Yintan, a village inside the mountains, but gets a road, although it is a narrow and tough way. Several trucks were parking on the road, so the space left seemed just could be for two wheels in one side of the car. The driver had a look at the road then to speed up. I stopped him and got off. I must admit that I was scared. I walked along and got on again when he passed all trucks. When I entered in the village, the feeling was like coming into a dream. It was not real. There were wooden houses, streets, Towers, just as a normal Dong village…but there was no person. Finally some children appeared. They were playing and laughing, which made the place even more looked like an illusion. Turning to another lane, old men appeared. They were sitting together inside the tower, smoking. All of them, young and old stopped their business and began staring at me. But they were friendly. They showed nice smile to me. Going inside, the whole village was having the nap in this warm afternoon. Dogs were sleeping on the road everywhere. Cats were resting in the corners. An old woman was dyeing her new cloths besides two big jars of Landian Cao (Baphicacanthus cusia), which were her magical blue dye.